As homeowners ourselves, we know that it isn’t necessarily easy to keep your household in optimal running order 24/7, so we’ve put together five ways to help you prepare for something that often creeps up on us when we least expect it – a blocked drain. Dealing with blocked drains in Portsmouth is just like dealing with them anywhere else in the area. We hope these five ideas will help you be prepared in the event of an unexpected blocked drain. Keep Emergency Contacts in View – You may be able to run very hot water down the drain to unblock it, but it is often too late by the time you have water standing in the sink. Make sure you have the emergency contact number for a trusted plumber and drainage specialist in view or in your smart phone for when you need their services at a moment’s notice. Our emergency helpline is available 24/7 at 07772 535248, for example. Regular Maintenance – Regular maintenance will help prevent blockages, but if you’re like many people in the Portsmouth area, you also pour cooking grease down the kitchen sink drain. This doesn’t necessarily render your regular maintenance useless, but it does keep it from being quite as effective as it otherwise would be. Don’t Dump Grease or Food in the Kitchen Sink – The only way to keep grease from blocking the drain is to avoid dumping it down the drain. Food and cooking grease do not belong down the drain for any reason. Don’t Drop Small Items Down the Bathroom Sink – Cotton buds are very small and can even be folded to be smaller. They should go down the drain easily, right? Wrong! They’re one of the primary causes of blocked drains in Portsmouth. Never drop facial cleansing pads, cotton balls, or cotton buds down the drain. Educate Others in Your Home – Make sure everyone knows these maintenance tips so you aren’t alone in your quest to prevent blocked drains. Discuss the importance of healthy drain habits with your children and everyone else who spends time at your home so you don’t have to deal with calling an emergency drainage specialist every few months. DrainBoss is available 24/7 for all types of plumbing and drainage emergencies. Our emergency helpline is available at 07772 535248 if you have a burst pipe or any other type of plumbing or drainage emergency any time day or night. We typically respond within the hour and we have all of the equipment available to thoroughly clean up all types of water or drainage emergencies. Give us a call at 02393 190789 if you’re looking for drain clearance in Portsmouth. 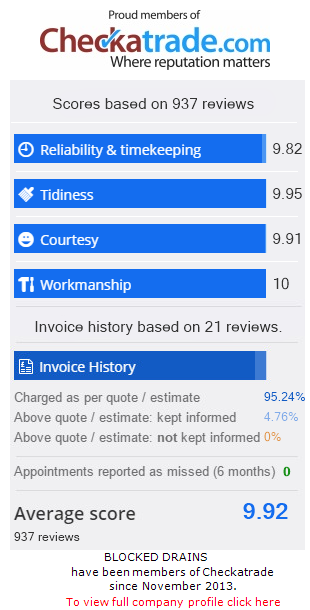 Mention the discount code DB2301 and we’ll take 5% off of your invoice immediately. We never charge a call out fee, handling fee, or any other hidden fees to inflate our billing. We are a locally owned and operated company that hires local workers, so we don’t have to make up extra fees to cover the costs of a franchise. What you see is what you get with DrainBoss.